Eagle Rock Entertainment is set to release Days Of Future Passed Live on a variety of formats on March 28th. The project will be available on DVD, Blu-ray, 2 CD and 2 LP. Filmed in high definition, this title captures The Moody Blues delivering an incredible performance of Days Of Future Passed live in its entirety with a full orchestra. This stunning concert includes: “Nights In White Satin,” “Tuesday Afternoon (Forever Afternoon),” “I’m Just A Singer (In A Rock And Roll Band),” “Isn’t Life Strange,” “I Know You’re Out There Somewhere,” “Question,” “Ride My See-Saw” and many more. The Moody Blues’ classic 1967 album Days Of Future Passed is regarded as one of the foundation stones of the progressive rock genre. In 2017, the band headed out on the album’s 50th Anniversary Tour which included the wonderful show captured here at the Sony Centre For The Performing Arts in Toronto, accompanied by a full orchestra. 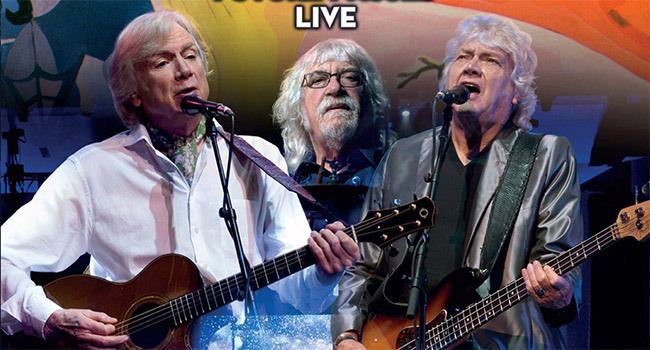 The concert begins with the band by themselves performing a selection of classic Moody Blues tracks before they are joined by the orchestra to perform Days Of Future Passed in its entirety plus a couple of fantastic encore tracks. The bonus feature, entitled “Remembering Days Of Future Passed,” delivers brand new interviews with Justin Hayward, John Lodge and Graeme Edge discussing the making of this classic album.